The Kona Unit has a long history, from a Canadian company with an equally deep heritage. While Kona celebrates its 30th birthday in 2018, the Unit name dates back at least half that. The Unit was (and still is) Kona’s cross-country singlespeed bike. Affordable and fun and fast, it was one of the first ever ‘production’ singlespeed mountain bikes and it’s still in the line today. Kona continues to delight its many fans by producing some incredible bikes, many of which seem a touch too edgy for the mega corporations to come out with, but which seem to sit well with Kona’s slightly anti-establishment, or at least devil-may-care stance. We’ve previously tried, and liked, the carbon Honzo, the Process and the Hei Hei Trail in the last couple of years and none have disappointed. Kona’s latest Unit X sees the rigid singlespeed mountain bike take a slightly different direction. What then is this? The Unit X takes that challenging, fun singlespeed attitude of that original Unit and adds just enough gears that it’s no longer such a stupid idea. Especially if your knees aren’t what they were in 2003 (ahem…). 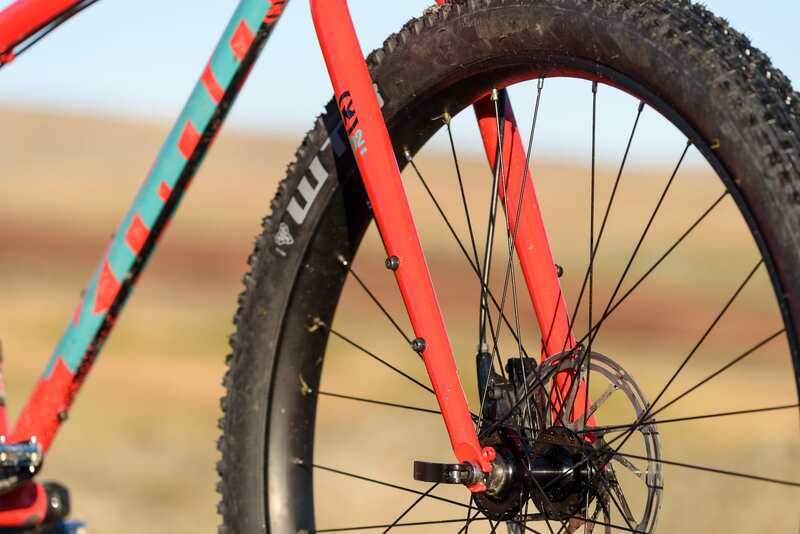 Kona has taken that skinny steel frame and rigid fork and added 11 wide-ranging gears without seemingly reducing that sense of attitude, or compromising that classic Kona silhouette. The singlespeed Unit still remains in the range, but now we can leave that for the youngsters. High volume plus rubber give the non-suspended frame and fork a lot more comfort and versatility. With a bright paint job, plus sized tyres and matchy-matchy black components everywhere, the X is a good-looking machine with, as we’ll see, a whole load of hidden charms that expand its usefulness. And, despite the ‘X’ name, it has 11, rather than 10 speeds, which will disappoint any classical scholars, but please anyone who’s ever had to shuffle an unsuitable bike to the top of a mountain somewhere, when the joys of a limited gear range have long since failed to be amusingly quirky. It’s a rather dashing looking machine don’t you think? Kona has, not surprisingly, gone for steel for the Unit X. Specifically, Reynolds 520 butted cromoly, with a complementing slender steel fork. Both frame and fork will take plus tyres and, while the bike’s intended use is left pretty much open to the user, early promo videos showed a Viking-like beardy-man called Erkki Punttila mooring his fishing trawler for the evening and bikepacking his Unit X deep, deep into the woods. Fork zits for bolt-on shenanigans. 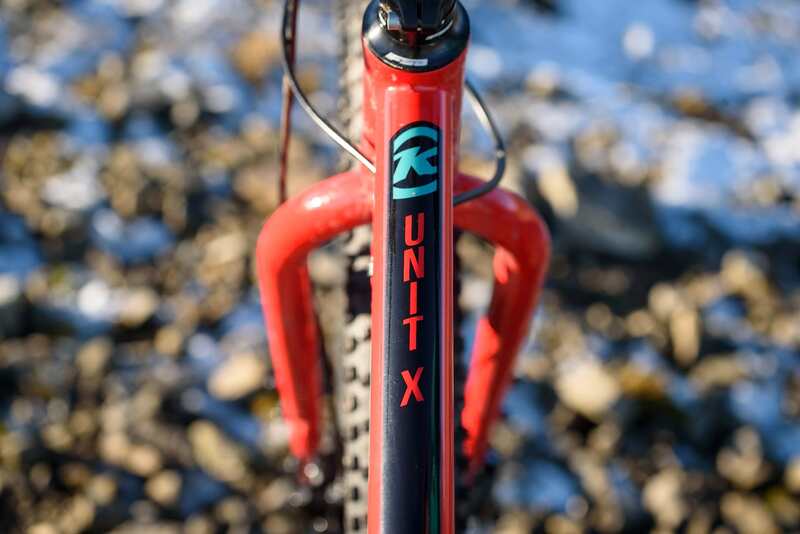 In order to facilitate this kind of behaviour, the Unit X comes with bottle bosses all over the place: two sets in the main triangle and another set under the downtube. And then the fork blades carry another set each side. While they’re not the triple-boss fittings beloved by the bikepacking cognoscenti, they’ll do fine for their primary purpose of strapping more stuff to your bike (and other adaptors like those from Wolftooth or King Cage can add extra bolt-on flexibility). There are even mudguard and rack eyes on the QR dropouts of the fork. Rack, mudguard and front derailleur compatible. Out back, the boss-fest continues with mudguard and rack eyes top and bottom of the seatstays. 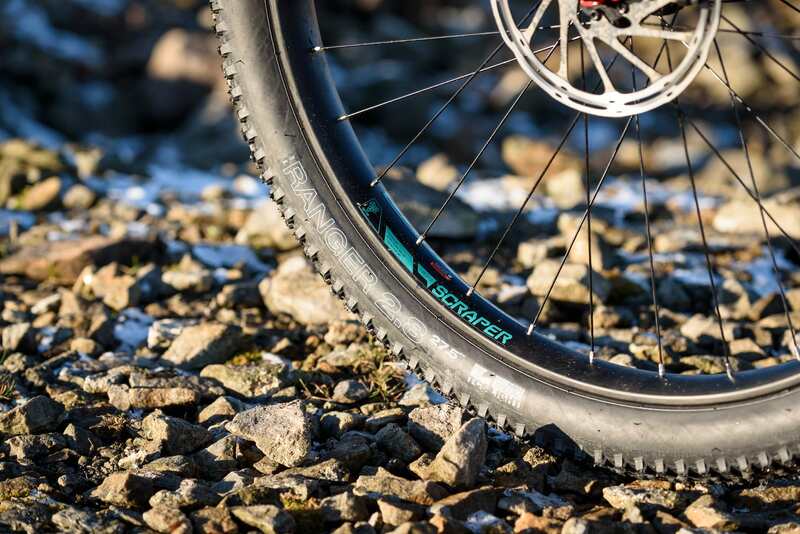 The dropouts themselves deserve a mention, as they’re Kona’s own sliding versions, should you wish to turn your back on all this technology and singlespeed your Unit (or add a hub gear…). The boss theme continues on the downtube with cabling for a front mech and a seemingly spare set of cable guides, until you realise that it’s for a dropper post. Kona has specced a 31.6mm seatpost, should you wish to add a dropper post (and increasing numbers of bikepackers are running short droppers for enhanced loaded descending). 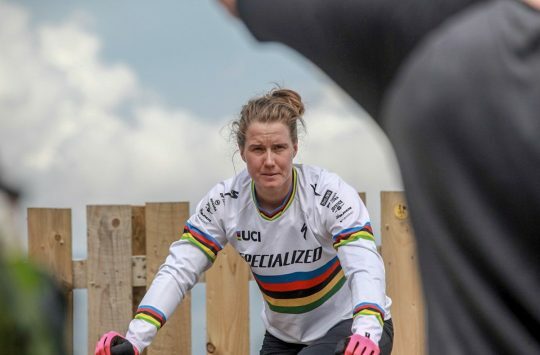 Of course you could just add one because you’re running the Unit on badass trails and you want to drop the saddle in a hurry. 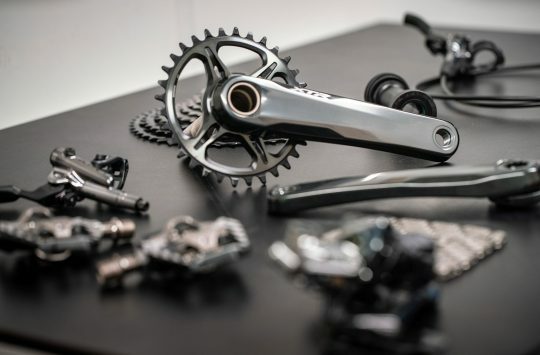 Gear-wise, we have a full SRAM NX transmission, with a giant 11-42T range (though still on a Shimano-compatible Formula freehub for future affordable spares), and up front is a diminutive 28T NX chainset. This is definitely a bike built for low gears and tall hills. 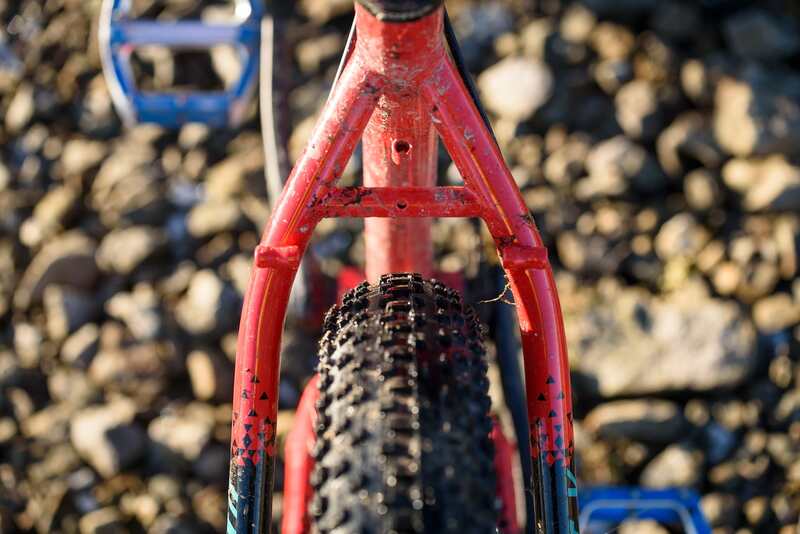 The chainstay yoke is a thing of 3D beauty, giving endless mud clearance for the tyre (while also offering a bit of a shelf for it…). Rather incredibly, we have a SRAM Powerspline bottom bracket with all the power of 2005 behind it. This sits very neatly inside the steel, threaded BB shell, but it seems incongruous with the rest of the recent 11-speed drivetrain technology. Up front we find a good selection of Kona-brand bars and stem, decent lock-on grips, post and saddle as you’d expect in this mid-price range. Brakes are SRAM’s new Level T brakes, which we’ve already found pretty good, though the brake lever and shifter clamps are both wide enough, they conspire to put the shifters uncomfortably out of reach for all but the monster-thumbed. 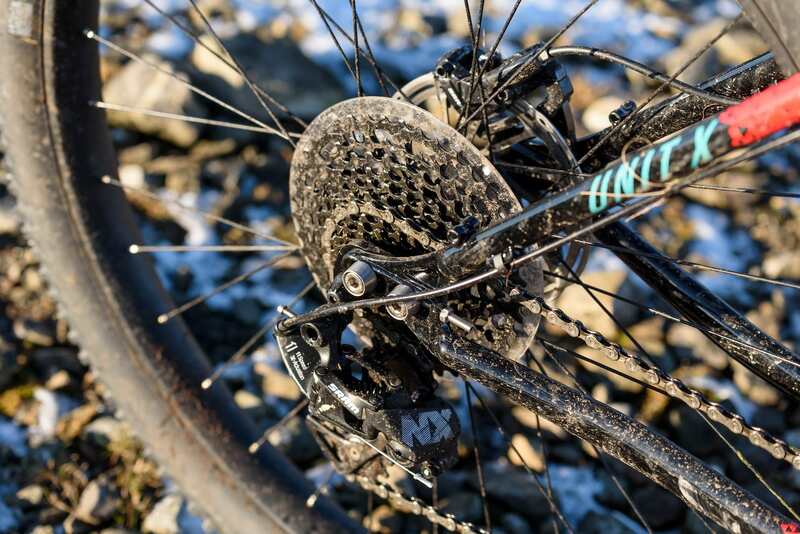 The ubiquitous WTB Scraper rims are fitted to QR hubs with WTB’s popular Ranger 2.8in plus tyres front and rear. Refreshingly, the bike comes with rims taped, and a pair of tubeless valves in the box. Top work, Kona! Oh yes, it will ride over things too. This review was published in Issue #117 of Singletrack Magazine as part of our ‘Unsprung Heroes’ group test. Keen to read more? 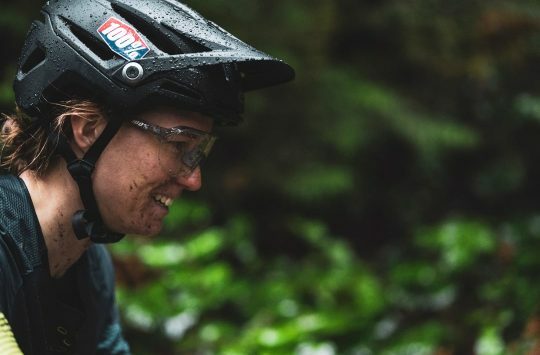 You can check out all of the stories and features from Issue #117 of Singletrack Magazine right here. New Carbon Wheels From Santa Cruz, Plus Two New V-10 Downhill Bikes! Wow. 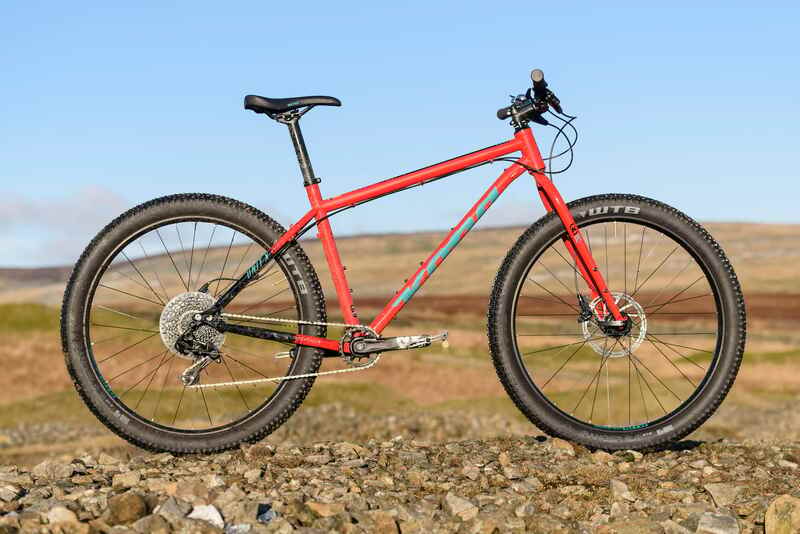 I love a Kona but a fully rigid bike weighing over 30lbs and costing £1200? Really? Hi! Thanks for the great review, Chipps. I’d like to know your measurements as I haven’t quite made up my mind whether to buy a size L or XL Unit 2019 model. I’m 181.5 cm tall (about 5’11” to 6′) and 87 cm inseam (about 34 inches). The size L equals to 18.5″ but the XL is 20.9″ so the difference is quite huge, I think, when compared to the Units of the previous years?